The Party that likes to present itself as the guardian of decency, religiosity and the Constitution has shown itself to be crass, irreverent and capable of a total disregard for the Constitution. Within just hours of the announcement of the death of Justice Scalia, Republicans from leadership to Presidential candidates threatened inaction should President Obama have the tenacity to actually nominate a replacement. Those who spew religious platitudes and accuse the President of ignoring the Constitution couldn’t wait a respectful interval before uttering their threats and demands. Through their frenzied reaction and utter disregard for common decency they have shown their hand and disclosed their strategy. It is a strategy that will set this country back decades. It is a fact that those who continue to describe themselves as the protectors of liberty are working relentlessly to diminish those liberties to all but a chosen few. It is through maintaining a majority on the Supreme Court that the right-wing conservatives that now control the Republican Party planned to achieve their goals. Over the past couple of years I have pointed to two facts. First, the laws that most impact our lives are those that are within the purview of state legislatures and governors. This includes everything from voting rights to availability of abortion to marriage equality and healthcare. If a state passes a law perceived by some to be contrary to a federal law it can be challenged and wind its way through the court system. After years the Supreme Court may choose to hear the case and rule on it. Naturally the ideological makeup of the Court is vital to the way in which the Court will rule. Which brings me to my second point. 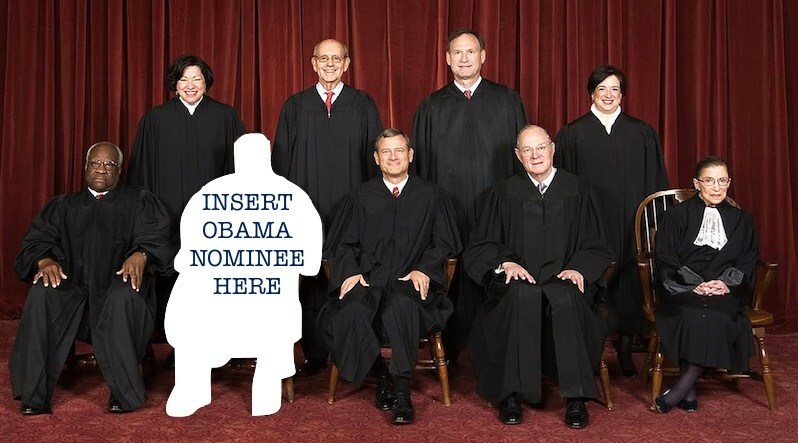 Presidents get to nominate and the Senate gets to approve new Justices for the Supreme Court. It is therefore obvious that if the majority of the senators are conservative, a President will have a very difficult time moving a liberal nominee through the process. This is what makes all elections, not only Presidential elections, so important. As long as both the state and national legislative bodies are controlled by conservatives, progressive ideas and ideals are in jeopardy. Scalia’s death has shaken the apple cart and placed the ideological makeup of the Court up for grabs. Since the four Justices currently considering retirement during the first term of the next President are liberal, even if a Democrat won the White House the ideological makeup of the Court would not change. However, with the death of Scalia it is possible for a liberal to be added to those already sitting and thus shift the balance to liberal from conservative. The threat by Republicans to stonewall any nomination presented by the President is contrary to the dictates of the Constitution. To state that it is inappropriate for the President to present a candidate because he is in the last year of his Presidency is disingenuous and dishonest. However, this is not about procedural niceties or Constitutional interpretation. It is about controlling the future of our nation. The panicked response make it clear that they will do whatever it takes to insure a conservative balance on the Court to guarantee the fulfillment of their vision of America. It is a vision that reduces freedom, liberty and opportunity. It is a vision that protects the rights of the few at the cost of the many. It is a vision wrapped in the robes of xenophobia, hatred and elitism. It is reminiscent of the rhetoric and attitudes of America in the 1930s and 1940s. We must not go back. This is a time for political activism not passivism. We must hold the Senate accountable to “we the people”.